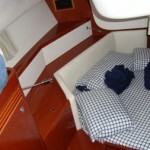 $3,500 per week Off Season: 10th July - 5th November. 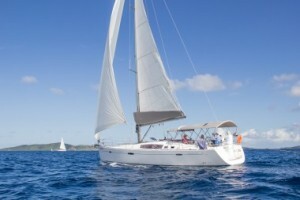 $4,000 per week Low Season: 1st May - 9th July and 6th Nov - 15th Dec.
$4,700 per week Mid Season: 2nd Jan - 31st Jan and 1st April - 30th April. 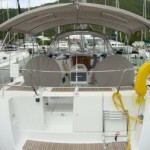 $5,500 per week High Season: 16th Dec - 1st Jan and 1st Feb - 31st March. 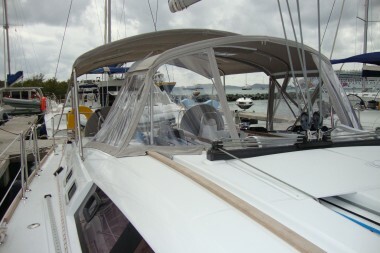 DeeDee & Zeus, our Beneteau 46, provides the ultimate cruising platform for 2 couples or a small family. 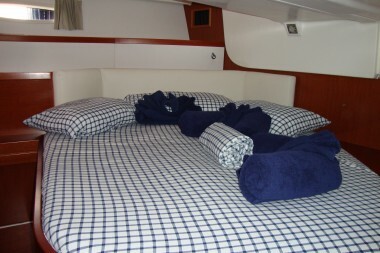 She sails fast, she looks beautiful and her unique 2 cabin layout offers both space and privacy while out on the water. 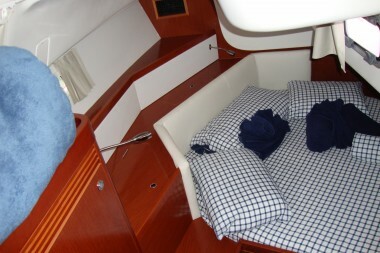 Upon boarding you will be welcomed by her comfortable and spacious cockpit. 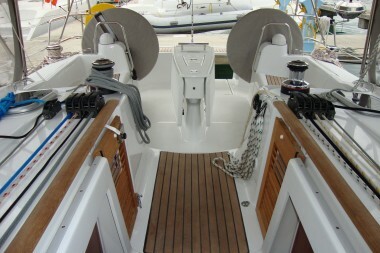 Twin Helm Stations with central navigation instruments make sailing the Oceanis 46 a breeze. 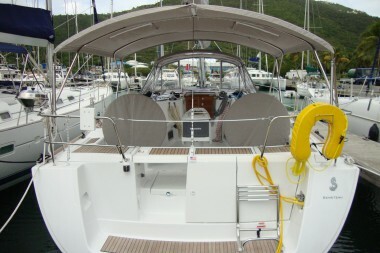 DeeDee & Zeus has a semi battened mainsail and furling Genoa, with all lines leading aft to the cockpit for ease of handling. 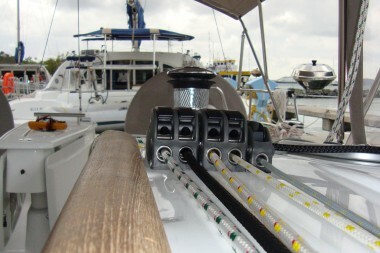 A bow thruster and primary electric winch make maneuvers effortless. 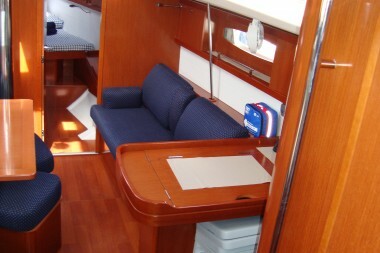 The folding cockpit table can be closed whilst underway for easy access, with a central storage locker. 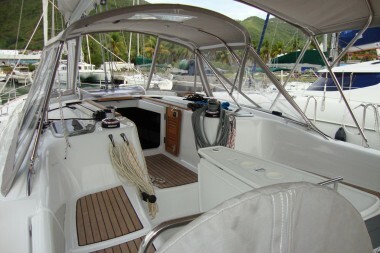 When opened up the cockpit table becomes the ideal location to enjoy dinners aboard in the warm caribbean breeze. 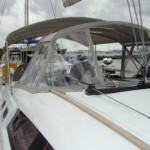 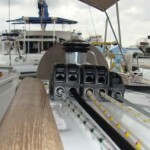 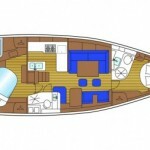 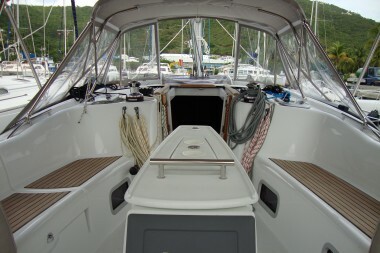 A walk through transom provides easy access for swimming and entering the dinghy. 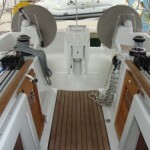 The swim deck has teak slats to prevent slips and hot and cold shower to rinse off after a dip. 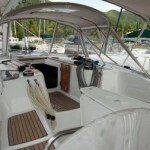 DeeDee & Zeus offers a 12ft dinghy with an 18HP outboard. 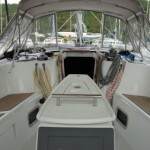 Making your way down the companionway you will notice nonskid on the steps and stainless steel handrails. 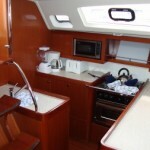 The cleverly designed galley is to port. 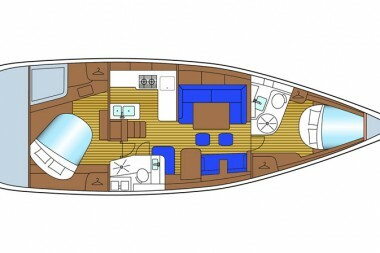 The blend of a well-proportioned interior with the beauty of Moabi hardwood make DeeDee & Zeus seem larger than than she is. 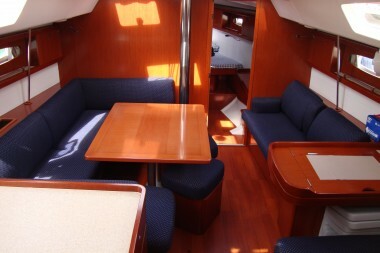 Her roomy interior make her an excellent choice for two couples or a family. 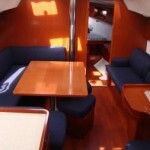 The comfortable U-shaped dining settee has two removable seats providing additional space for guests. 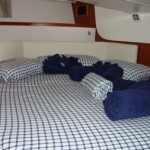 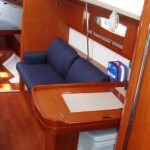 To starboard is an additional settee, chart table and navigator’s seat. 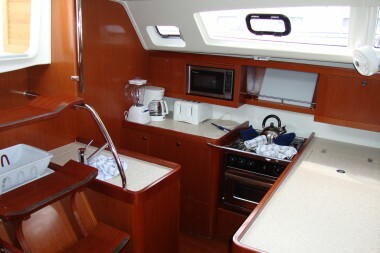 You will find corian countertops, microwave, stand-up refrigerator, freezer and ample storage make meal preparation a pleasure. 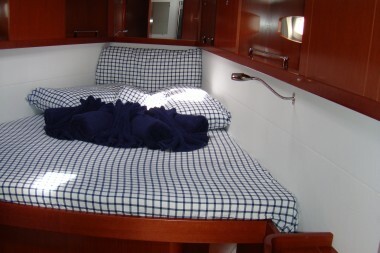 Both fwd and aft cabins feature queen size beds, fans, opening hatch & port, dressing table & hanging locker. 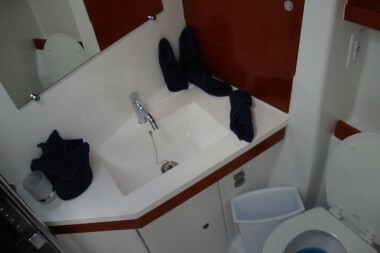 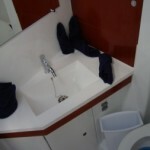 Both heads have a separate shower door and the forward head is equipped with an electric marine toilet. 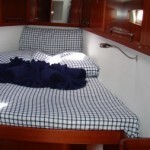 DeeDee & Zeus is equipped with a generator and air-conditioning make her comfortable below deck in all weather.